While most dinosaurs did not fly, more are known to have had all the equipment necessary. 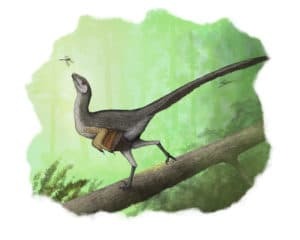 Asymmetrical feathering is seen as a vital step in the evolutionary process for modern birds, and the Jiananhua Dragon (or, Jianianhualong Tengi) was recently found to have tail-feathers perfectly structured for flight as long as 125 million years ago. Named after the financier of the excavation, its name is not very descriptive of what it is, or why it’s important. Jianianhualong was discovered and an exceptionally-clear piece of the evolutionary puzzle was added. Paleontologists have discovered many feathered maniraptoran specimens in the Jehol group of China, a hotbed of stunningly detailed Jurassic and Cretaceous fossils, with the hopes of linking a troodontid and the presence of pennaceous feathers earlier in evolutionary history – feathers with long, stiff quills and barbs that are longer on one side than the other. After several species were observed to have pennaceous feathering but lacked the distinguishing characteristics of a true troodontid, luck was struck. A beautifully preserved specimen was discovered in lower cretaceous rock, and Jianianhualong Tengi was named. 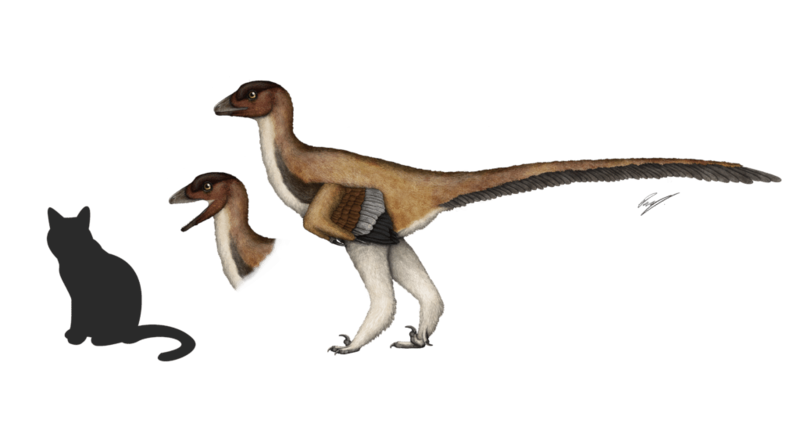 Living 125 million years ago, Jianianhualong represents the “earliest known instance of asymmetrical troodontid feathering, suggesting that feather asymmetry was ancestral to Paraves”, a contention that literally pushes back our conception of bird-flight evolution millions of years. Consider a contemporary of the time, Caudipteryx – which sported symmetrical feathering on the tail. 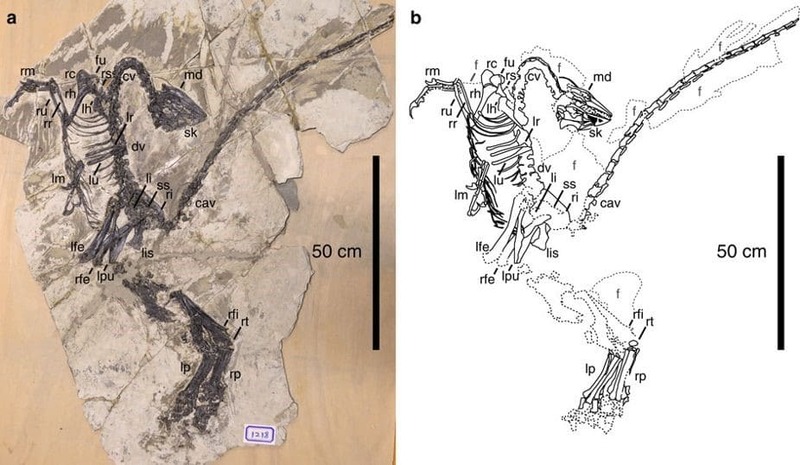 Significantly, Basal Paraves include the famous Archaeopteryx, and Jianianhualong’s discovery shows these early troodontids had very similar feathering patterns, particularly in the tail. Jianianhualong Tengi was a small animal, even for its day, only about three feet long and weighing in at a spritely few pounds. 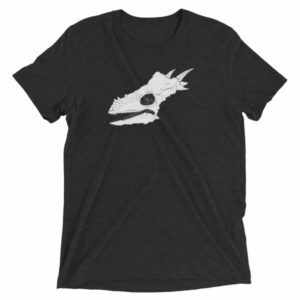 It’s small jaw capable of nipping at insects or other smaller creatures. Jianianhualong looked a lot like an exotic crow, and possibly acted very much like one too. Closely related species of troodontid show behaviors as specific as roosting like birds, with heads tucked under their forelimbs. And analysis of their braincase suggest intelligence very much in range of bird-intelligence – particularly in line with precise motor-control and complex perceptual ability – highly implying sophisticated social behavior. The presence of asymmetrical feathering in the tail frond heavily implies that this important step in bird-flight evolution took place farther back, which further implies the dinosaurs with asymmetrical feathering on their forelimbs had greater flight capability than expected. This suggests evidence for modular evolution, as posited by the research team. 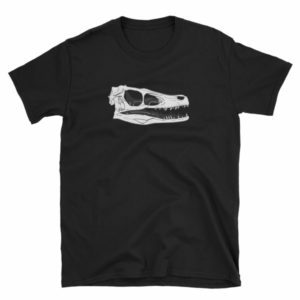 Troodontids seem to have developed the ‘distinct spatial organization of the mosaic of plesiomorphic and apomorphic osteological features’ quickly over time. In other words, Jianianhualong shows the evolution of flight itself, in a way, literally took off – so fast almost all other features were essentially put on hold.